I’ve been trying to write this post for four years. I’m not exaggerating. For the past four years, when September rolls around, I put this post on my calendar, waiting for the raspberries at my parents’ house to ripen. And for the past four years, our raspberries, which are gorgeous and achingly sweet and juicy, have been 100% infested with raspberry fruitworms. It’s devastating. The anticipation of opening up a perfectly ripe, deep red, juicy berry, hoping beyond hope that there will be no squirmy white bugs inside, and then to have all your hopes dashed in an instant – heartbreaking. 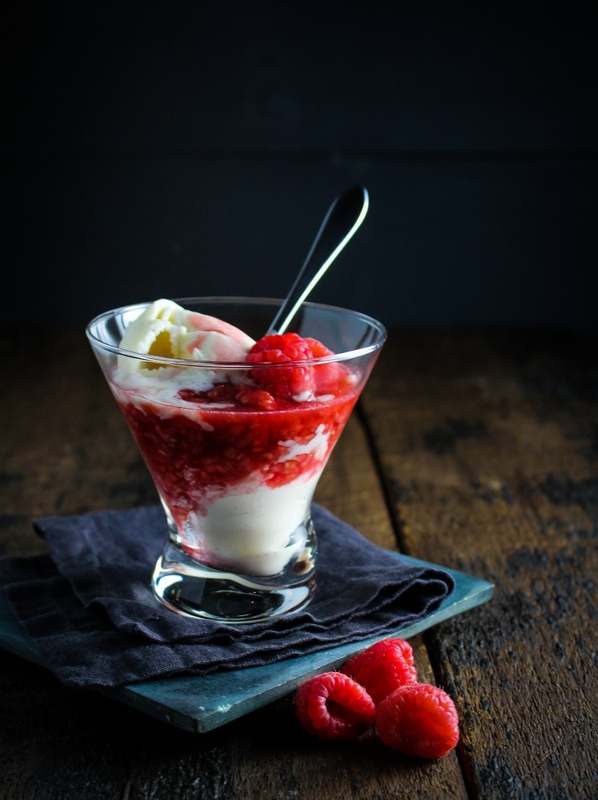 This year, I’d had enough – I was going to buy my raspberries, make this dessert, and satisfy this particular September craving. When the weather starts to turn cooler, I begin daydreaming of Prague, although the longer I spend away from my one-time home the fainter the daydreams become. Cold, gray days in particular pull back memories tinged with longing: the long winding tram ride from my apartment to school; my daily afternoon snack of mulled wine and candied almonds, eaten with gloved fingers standing on the cobbled corners; wandering the rose gardens on top of Petrin hill, with nowhere else to be for hours; the Christmas markets in all their splendor, filled with warm light and the smell of sausages and potatoes; hiking through falling snow in the far corners of the country, feeling like we were the only people for miles and miles. I could go on and on, but really, I should just go back. I want to take Trevor there and share that city with him, relive some of my old memories and create new ones. Although I’ve traveled many places since Prague, it still holds a special place in my heart – sometimes I wonder if it’s better to have a few places you really love than to travel all over the world in search of you’re not quite sure what. When my family came to visit me in Prague, being able to order something called “hot love” was one of my 11 year old brother’s greatest pleasures. 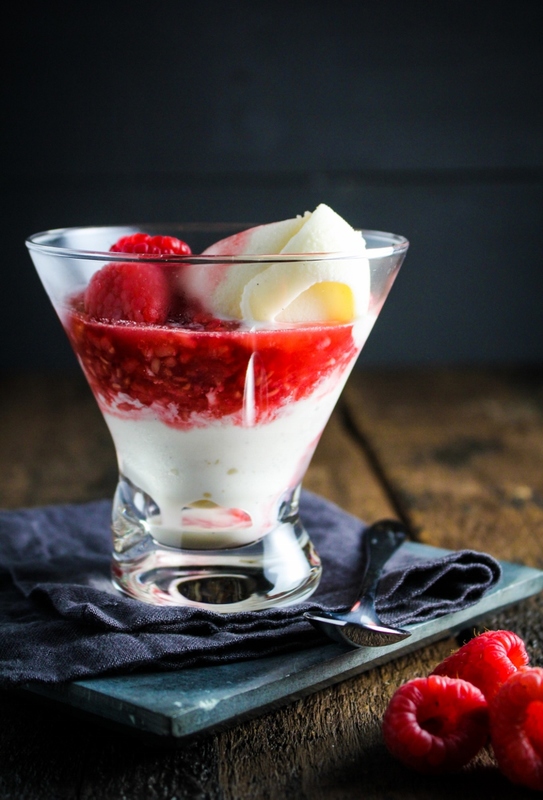 It’s a dessert that goes by more than one name: Horká láska. Hot love. Horké maniny. 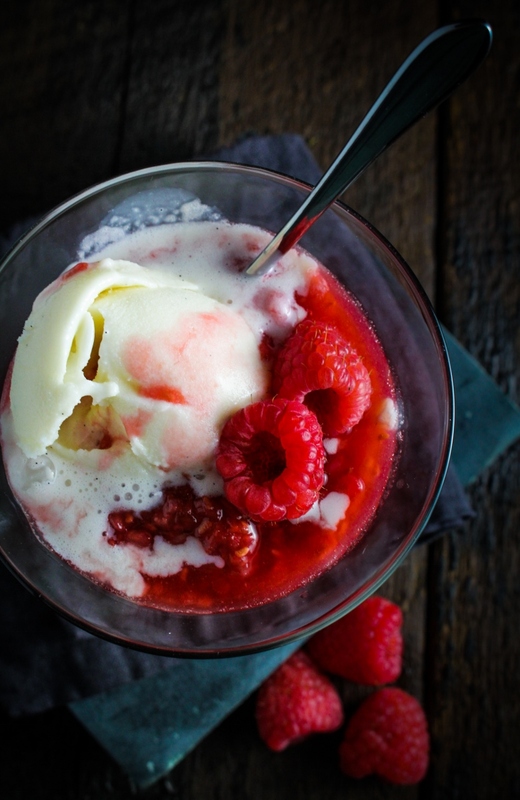 Piping hot raspberries smothering a scoop of vanilla ice cream. Although it’s name may be suggestive, the dessert itself is pure, simple and completely sublime. 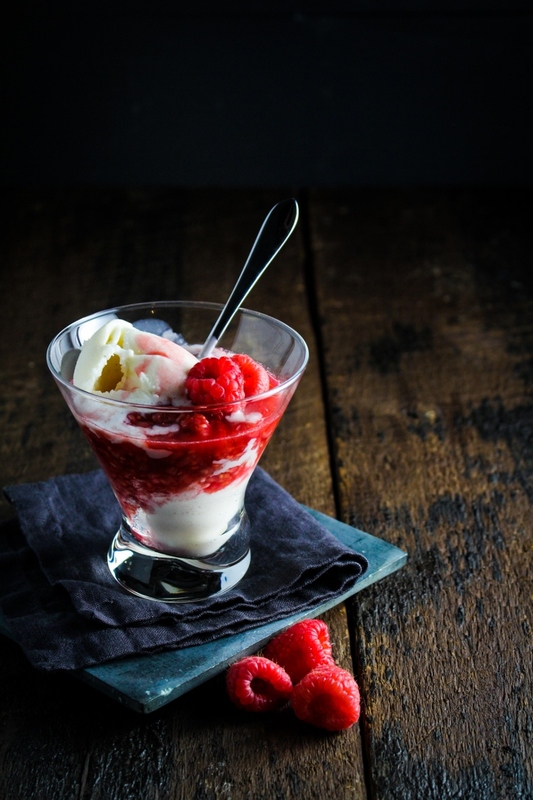 A staple of most Czech menus, horká láska is not just a dish of ice cream with raspberry sauce, it is a dish of juicy, steaming-hot raspberries with just enough ice cream on top so that it has completely melted into the berries by the time you are 3/4 done with the dish. 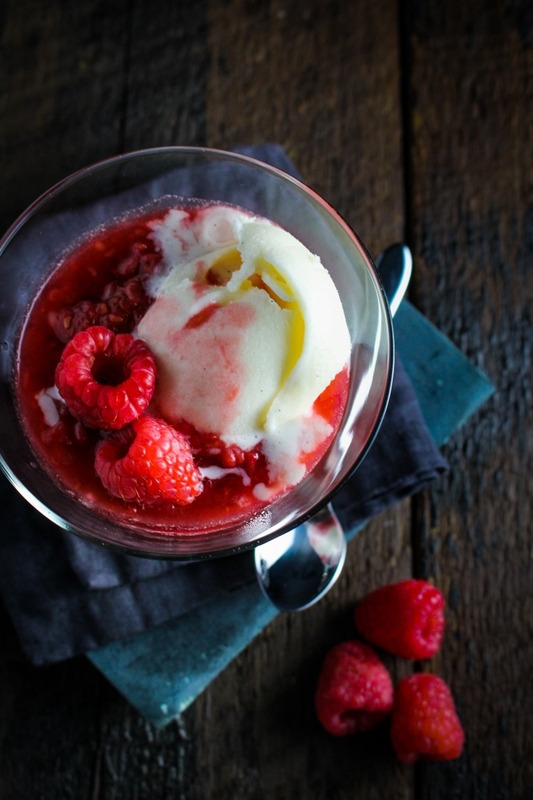 The trick is all in getting the right ratio and remembering that it’s called “hot raspberries” and not “ice cream with raspberries” for a reason. I did find one traditional recipe (in Czech) that I used for guidance in recreating this classic dessert, but it’s a pretty straightforward concept that doesn’t need to be overthought. The addition of framboise and a pat of butter take the sauce up another level, but you don’t want either to overwhelm the taste of raspberries. It’s a perfect dessert for early fall, with the contrast of hot with cold and fresh with creamy satisfying both summer and fall cravings. Add the raspberries and sugar to a small saucepan and heat over medium heat. Cook the raspberries, stirring occasionally, until they are broken down and juicy and the sauce is steaming, about 5-7 minutes. Add the framboise and salted butter, stir to combine, then remove from heat. 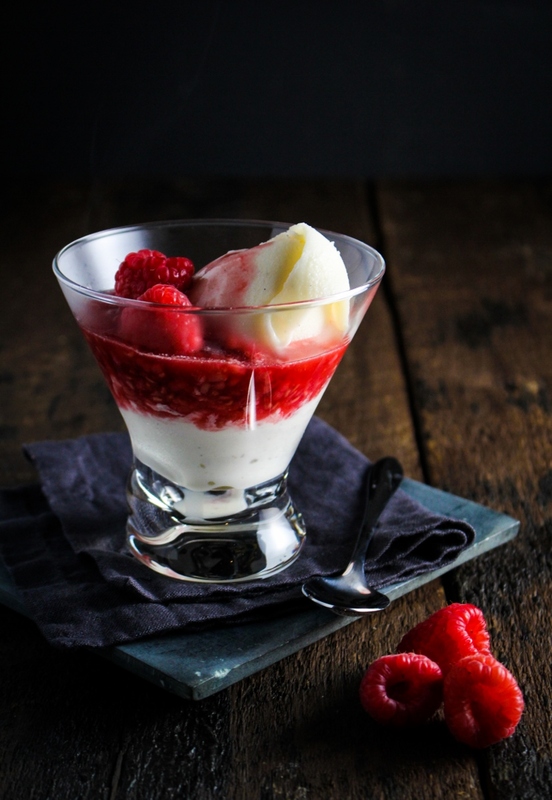 Spoon a generous amount of raspberry sauce over each scoop of vanilla ice cream and serve immediately. Oh my goodness – what a gorgeous post… so worth the four year wait. (though I am sorry to hear about your critter-infested fruit) I’m ready to book a flight to Prague! Can I leave tomorrow? This is so beautiful, it was worth the wait. I had no idea you could get fruit worms! Dang old worms get into everything. Lovely pictures, but even more lovely writing. What an incredible post.. so beautifully written and photographed. Thanks for sharing.